Active myofascial trigger points are one of the major peripheral pain generators for regional and generalized musculoskeletal pain conditions. Myofascial trigger points are also the targets for acupuncture and/or dry needling therapies. Recent evidence in the understanding of the pathophysiology of myofascial trigger points supports The Integrated Hypothesis for the trigger point formation; however unanswered questions remain. Current evidence shows that spontaneous electrical activity at myofascial trigger point originates from the extrafusal motor endplate. The spontaneous electrical activity represents focal muscle fiber contraction and/or muscle cramp potentials depending on trigger point sensitivity. Local pain and tenderness at myofascial trigger points are largely due to nociceptor sensitization with a lesser contribution from non-nociceptor sensitization. Nociceptor and non-nociceptor sensitization at myofascial trigger points may be part of the process of muscle ischemia associated with sustained focal muscle contraction and/or muscle cramps. Referred pain is dependent on the sensitivity of myofascial trigger points. Active myofascial trigger points may play an important role in the transition from localized pain to generalized pain conditions via the enhanced central sensitization, decreased descending inhibition and dysfunctional motor control strategy. Myofascial trigger points (MTPs) are hyperirritable spots in skeletal muscle associated with palpable nodules in the taut bands of muscle fibers. When these palpable nodules are stimulated mechanically, local pain and referred pain can be induced together with visible local twitch response [1, 2]. MTPs can be either active or latent. An active MTP is one that refers pain either locally to a large area and/or to another remote location, the local and referred pain can be spontaneous or reproduced by mechanical stimulation which elicits a patient-recognized pain. A latent MTP does not reproduce the clinical pain complaint but may exhibit all of the features of an active MTP to a minor degree. Myofascial pain syndrome due to MTPs can be acute or chronic, regional or generalized; it can also be a primary disorder leading to local or regional pain syndromes or a secondary disorder as a consequence of other conditions . Active MTPs contribute significantly to the regional acute and chronic myofascial pain syndrome [2, 3], such as lateral epicondylalgia , headache and mechanical neck pain  and temporomandibular pain disorders . Active MTPs are also the main peripheral pain generator in generalized musculoskeletal pain disorders , such as fibromyalgia and whiplash syndrome [7, 8]. MTPs are the targets for acupuncture and/or dry needling  and other pain therapies. Indeed, MTP anesthetization decreases both pain intensity and central sensitization in local pain and generalized pain conditions [8, 10, 11]. Two reviews have been published recently focusing on the current state of knowledge of myofascial pain syndrome associated with MTPs [12, 13]. New evidence has emerged suggesting an important role of spontaneous electrical activity (SEA) at MTPs in the induction of muscle pain and central sensitization. This article reviews the literatures in the last decade about the SEA at MTPs; in particular, how SEA contributes to the induction of local and referred pain and how active MTPs are involved in the transition from the localized pain to generalized pain conditions. Registered with intramuscular needle electromyography (EMG) when the muscle is at rest, SEA is one of the characteristics of MTP [14, 15]. SEA is dysfunctional extrafusal motor endplate potential (EPP) , rather than from the gamma motor units within muscle spindle. Muscle tissue disruption is observed immediately after the termination of exercise, such as cytoskeletal disruptions, loss of myofibrillar registry and loss of cell integrity as manifested by intracellular plasma fibronectin stain, hypercontracted regions and invasion of inflammatory cells. In particular, muscle fiber hypercontraction occurs adjacent to fiber plasma membrane lesions and is associated with very short sarcomere lengths [16, 17]. Prolonged or unaccustomed exercise, acute and chronic mechanical and electrical trauma and prolonged ischemia lead to cell membrane damage which is the initial event in muscle damage [18, 19]. Following cell membrane damage, influx of Ca2+ is increased, leading to Ca2+ overload. As a result, calpains and phospholipase A2 may be activated; production of reactive oxygen species may be increased; and mitochondrial Ca2+ may be overloaded, thereby further worsening the damage in a self-reinforcing manner . In addition to Ca2+ overload, an increase in Na+ permeability and the accompanying increase in Na+ influx also induce membrane depolarization . Thus, mechanical trauma causes direct injury to the cellular membrane, causing Ca2+ and Na+ to flood the injured tissue. The Ca2+ overload contributes to the initiation of spontaneous activity at motor endplate . The localized Na+ conductance change in the membrane of the active muscle fiber may also lead to the initiation of spontaneous action potentials at motor endplate [22, 23]. The acetylcholine (Ach) released at a motor unit associated with MTP may be also modulated by other ion channels . EPP, which is a local depolarization of the muscle fibers, spreads a short distance along the muscle fibers, with a decrement of about 50-75 per cent per millimeter. 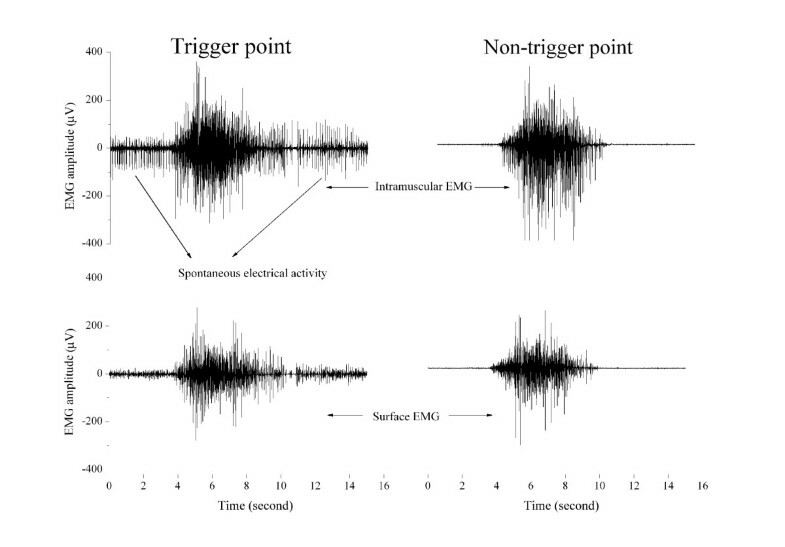 If the EPP exceeds a certain critical level (by summation of successive EPPs), endplate spikes are initiated , explaining the clinical phenomenon that SEA associated with MTP is registered only in a localized spot in the muscle with intramuscular needle EMG. Enormously increased abnormal spontaneous release of Ach produces the SEA. SEA is a combination of endplate noise and endplate spikes with action potentials generated by sufficient amounts of spontaneously released Ach [2, 26]. Studies in MTP animal models also show that the SEA is significantly decreased by botulinum toxin which inhibits the release of acetylcholine at the neuromuscular junction . Both extrafusal (alpha motor unit) and intrafusal fibers (gamma motor unit within muscle spindle) are cholinergically innervated; the decrease in the SEA following botulinum toxin application cannot differentiate the source of SEA from the alpha motor unit or from the gamma motor unit. The discharge patterns of static and dynamic gamma motoneurones contribute to the control of locomotion, but contraction of the intrafusal muscle fibers does not contribute to the force of muscle contraction . Muscle force is positively correlated with the amplitude of EMG during dynamic contraction. Analysis of the motor behaviors of an MTP clearly shows that intramuscular EMG activity at an MTP (SEA) exhibits similar motor behavior to the surface EMG activity over an MTP and is also similar to the intramuscular and surface EMG over a non-MTP during voluntary muscle contractions in the upper trapezius muscle (Figure 1), suggesting that the SEA activity during movement contributes to the muscle force production. Thus, this motor behavior of MTP indicates that the SEA originates from the extrafusal motor endplate but not from the intrafusal motor endplate. No electrophysiological methods are currently available to record electrical activities from intrafusal motor endplate directly in the muscle. Instead, efferent discharges of intrafusal motor endplate are indirectly assessed with microneurography recorded from peripheral nerve fibers in animals and humans. Efferent discharges of intrafusal motor endplate are uncorrelated with any activation of extrafusal muscle fibers in humans  though intrafusal motor units are generally spontaneously active. However, the SEA may be recorded with intramuscular EMG in humans and originates from extrafusal motor endplate in several pathophysiological conditions , including MTPs . SEA at MTPs may play a significant role in the induction of pain. An example of motor behavior of spontaneous electrical activity (SEA) of a myofascial trigger point (MTP) during trapezius muscle contraction. The electromyographic (EMG) activity of the SEA of an MTP is similar to the surface EMG over an MTP on one side of the upper trapezius and to both the surface and intramuscular EMG activity of a normal muscle point on the other side of the upper trapezius. Note: following needle insertion into a MTP, surface EMG recording shows low amplitude activities. Local and referred muscle pain can be consistently induced by mechanical stimulation of active MTPs. The local and referred pain from active MTPs can be recognized by the patients as their pain experience during daily activities (activity related pain) and/or at rest (spontaneous pain) . Active MTPs are responsible for patient's pain. Local and referred pain from latent MTPs are not recognized by the patients; thus latent MTPs are not responsible for patient's pain. Pressure pain threshold (PPT) measurement over an entire muscle shows the heterogeneous distribution (ie the sites with the lowest PPT corresponding to the locations of MTPs in healthy subjects), fibromyalgia  and chronic tension type headache , indicating that muscle nociceptors are sensitized at MTPs. The sensitized nociceptors lead to an increased excitability of the nociceptive nerve ending. In addition to the nociceptor sensitization, non-nociceptors (mainly the large diameter muscle afferents) are also sensitized at MTPs [33–35]; the non-nociceptors which normally do not contribute to pain perception are now involved in pain generation at MTPs. Thus, local pain and tenderness at MTPs are largely due to nociceptor sensitization with a lesser contribution from non-nociceptor sensitization. Nociceptors and non-nociceptors sensitization at MTPs is a localized event in the muscle. The algesic substances are significantly increased at active MTP compared with latent MTP and normal muscle point . These algesic substances may partly be released from the peripheral sensitized nociceptors that drive the pain associated with tissue injury  and may also be released from the sustained muscle fiber contraction [38, 39] within muscle taut band . A further study on both intramuscular and surface EMG activity recorded from an MTP for minutes revealed that the SEA was similar to a muscle cramp potential and that the increase in local muscle pain intensity was positively associated with the duration and amplitude of muscle cramp episodes . The firing frequency of motor units (14.5 ± 5.1 pulses per second) during electrically-induced muscle cramp  is similar to that of the endplate spikes of the SEA in humans. Localized muscle cramps may induce intramuscular hypoxia, increased concentrations of algesic substances and direct mechanical stimulation of nociceptors and pain [42, 43]. Human experimental studies showed that the irritability of a MTP was highly correlated with the prevalence of the SEA in the MTP as lower PPTs were associated with higher amplitude of the SEA . An increased MTP sensitivity is associated with the occurrence of muscle cramps  and glutamate injection into a latent MTP also increases sympathetic activity with a decreased blood supply to the muscle and the skin . Thus, MTP pain and tenderness is closely associated with sustained focal ischemia and focal muscle contraction and/or cramps within muscle taut band. Muscle cramps may partly underlie local and referred pain in chronic musculoskeletal pain syndromes associated with active MTPs. Referred pain is defined as the pain the patient feels at a remote site away from the location of an MTP. Referred pain from active MTPs is sometimes the sole complaint of patients with pain. A typical example is that patient feels pain in the front shoulder only but the pain actually comes from an active MTP in the infraspinatus. The occurrence of referred pain is dependent on the sensitivity of an MTP. Active MTPs induce larger referred pain area and higher pain intensity than latent MTPs . Experimental human pain studies also showed that the maintenance of referred pain was dependent on ongoing nociceptive input from the site of primary muscle pain [47, 48]. Animal studies showed that sustained muscle damage might sensitize dorsal horn neurons and open silent synapses in adjacent segments and excite neurons that supplied the body regions in which the referred pain was felt . Sustained focal ischemia and the increased algesic substances associated with muscle contraction and/or muscle cramps at MTP may sensitize the dorsal horn neurons and supraspinal structures inducing referred pain. Referred pain is a reversible process of central sensitization or neuroplasticity  maintained by increased peripheral nociceptive input from MTP. Inactivation of active MTP results in the disappearance of referred pain . It is important to note that referred pain usually occurs seconds following mechanical stimulation of an active MTP in humans, suggesting that the induction of neuroplastic changes related to referred pain is a very rapid process, similar to the induction of central descending inhibition mechanism which is recruited a few milliseconds following intramuscular nociceptive electrical stimulation . In summary, referred pain is a process of central neuroplasticity dynamically maintained by sustained nociceptive input from MTP associated with the SEA. In addition to the role in induction of local and referred pain, the SEA may also contribute to the formation of muscle taut band. An MTP taut band is subjectively felt by the examiner during manual palpation. Penetration of an acupuncture needle into the taut band reveals a feeling of higher resistance as compared to surrounding normal muscle tissues by the practitioners. The existence of a taut band is demonstrated by magnetic resonance elastography, indicating that the stiffness of the taut bands may be 50% greater than that of the surrounding muscle tissue . Ultrasound visualization of the taut band show that MTPs appear as focal, hypoechoic regions on two-dimensional ultrasound and as focal regions of reduced vibration amplitude on vibration sonoelastography, indicating a localized, stiff nodule . These findings suggest that taut bands associated with MTP are detectable and quantifiable tools for MTP diagnosis. The mechanisms for the formation of muscle taut band are not fully understood. The molecular mechanisms of taut band formation have been detailed in a recent review . SEA originates from the extrafusal motor endplate (motor unit potential) and the SEA represents focal muscle fiber contraction and/or muscle cramp. Muscle fiber contraction contributes significantly to the formation of muscle tension . It is believed that this involuntary focal muscle fiber contraction and/or muscle cramps within taut muscle band contributes significantly to muscle tension and to the formation of taut band associated with MTP [24, 43]. Additional contributions to the formation of taut band may come from muscle spindle afferents giving afferent signals to the extrafusal motor unit through the H-reflex pathway [33, 55, 56] and from the sympathetic facilitation to the SEA  and to MTP sensitivity . Sympathetic neurotransmitter noradrenaline not only strengthens muscle tone by boosting endogenous glutamate-mediated excitation, but also transforms sub-threshold glutamatergic activity into a robust excitatory drive capable of triggering motoneurone activity . Thus, muscle taut band associated with MTP may come from increased motor unit excitability with an increased release of Ach and modulated by muscle spindle afferents and sympathetic hyperactivity. One of the peripheral pain generators in the muscle, MTP may have generalized effects on the human nociceptive system. Apart from localized pain conditions, such as chronic tension type headache and migraine , myofascial low back pain , chronic prostatitis/chronic pelvic pain syndrome in men , lateral epicondylalgia , headache and mechanical neck pain  and temporomandibular pain disorders , active MTPs contribute significantly to the generalized pain conditions, such as whiplash syndrome  and fibromyalgia [7, 10], suggesting that active MTPs play a significant role in the transition from the localized pain to generalized pain conditions. There are several ways whereby active MTPs may induce widespread pain or spatial pain propagation. Central sensitization mechanisms are involved in both the localized and generalized chronic pain conditions. Descending facilitatory and inhibitory mechanisms are involved in acute muscle nociception . Persistent pain from tissue injury or inflammation contributes significantly to the induction of central sensitization and results in an enhanced net descending facilitation that contributes to the amplification and spread of pain. Mechanical stimulation or activation of latent MTPs induce mechanical hyperalgesia in extrasegmental deep tissues  and electrical stimulation of an active MTPs significantly enhance somatosensory and limbic activity in the brain . Inactivation of active MTPs with consecutive anesthetic injections significantly decreases mechanical hyperalgesia and/or allodynia and referred pain in both localized pain condition of migraine  and generalized pain conditions of fibromyalgia  and whiplash syndrome . Thus, active MTPs are one of the sources of peripheral nociceptive input inducing central sensitization. Central sensitization may increase the MTP sensitivity through segmental pathways resulting in decreased mechanical pain threshold  and increased amplitude of the SEA . The influence of a central MTP on satellite MTPs may play a significant role in the segmental pain propagation in chronic generalized pain conditions; however, no evidence supports that central sensitization can induce the development of new MTPs. Further studies are needed to investigate the relationship between central sensitization and the MTP formation. In chronic musculoskeletal pain conditions, the balance between supraspinal facilitation and inhibition of pain shifts towards an overall decrease in inhibition. Muscle pain impairs diffuse noxious inhibitory control mechanisms . Inactivation of active MTPs with ultrasound and dry needling temporarily increases mechanical pain threshold in local pain syndromes [67, 68]. Inactivation of active MTPs results in an increased mechanical pain threshold in fibromyalgia patients . Active MTPs are one of the major contributors to the impaired descending inhibition in chronic musculoskeletal pain conditions. Impaired descending inhibition in chronic musculoskeletal pain conditions, which is same as an enhanced central sensitization, leads to an increased mechanical pain sensitivity of muscle tissue (ie muscle becomes more tender upon mechanical stimulation). Related to this mechanism, PPT at latent MTPs located in various body parts may become lower; latent MTPs are easily activated in response to various perpetuating factors. Pain propagation may thus be observed in the segmental and/or extrasegmental muscles in generalized chronic pain conditions. Upper trapezius muscle is active across the duration of shoulder activities and the frequency of differential activation between cranial and caudal regions within the upper trapezius is lower in fibromyalgia patients than controls [69, 70]. Sustained muscle activation induces muscle ischemia  and increases the release of algesic substances in the muscle and cytokines in the blood [39, 72] and eventually decreases the muscle mechanical pain threshold more in the cranial region than the caudal region. Sustained muscle contraction at low load levels may damage muscle tissues and increase MTP sensitivity and latent MTPs may be activated and result in local and referred pain. An increased muscle co-activation has also been observed in local pain conditions, such as tension type headache . An increased co-activation of antagonist musculature may reflect reorganization of the motor control strategy in patients, potentially leading to muscle overload and increased nociception. While active MTPs are present in these patients, there is no direct evidence on whether the impaired motor control strategy is associated with the existence of active MTPs. However, latent MTPs are associated with impaired motor activation pattern and the elimination of these latent MTPs induces normalization of the impaired motor activation pattern [74, 75]. The impaired motor control strategy may partially underlie the induction of local pain and segmental pain propagation. SEA at the MTP arises from the extrafusal motor endplate, representing focal muscle fiber contraction and/or muscle cramp potentials within taut band. The sustained focal muscle fiber contraction and/or muscle cramp potentials contribute to the induction of local and referred pain. Active MTPs may play an important role in the transition from the localized pain to generalized pain conditions via the enhanced central sensitization, decreased descending inhibition and dysfunctional motor control strategy. HYG did the literature search. HYG, CFP and SWY jointly drafted the manuscript. HYG revised the manuscript. All authors read and approved the final version of the manuscript.